Centrifugal Barrel Finishing | High-Energy Finishing | ISO Finishing Inc. Centrifugal Barrel Finishing | High-Energy Finishing | ISO Finishing Inc.
Centrifugal Barrel Finishing (CBF) is a high-energy finishing method where Centrifugal Barrel Machines are used. A great example of this type of machine is our HZ series. These machines are typically made up of two or four individual barrels (or drums) mounted on the outer edge of a turret. The turret is rotated in one direction, causing the barrels to rotate in the opposite direction creating very high G-forces or pressures, as well as considerable media sliding action within the drums. The movement mimics that of a ferris wheel. This action is due to either a Timing Belt, V-Belts or Chain that is connected between the main shaft and the centerline of the 4 barrels. In operation, this turret rotation creates a high centrifugal force. This force compresses the load into a tight mass causing the media and parts to slide against each other removing burrs and creating a superior finish. Short cycle times are realized as a result of the high centrifugal energy being applied to the parts. Centrifugal Barrel Finishing is Best for What Projects? Barrel tumblers work well for jobs requiring heavy burr removal. They are also good for burnishing, rapid radiusing of edges, heavy deburring with or without media and tumbling die-castings to break the parts off the runner. They are also a good choice for very heavy loads that will not run well in a vibratory machine where the media alone can sometimes weigh up to 300 lb per cubic foot. When estimating the capacity required, keep in mind that barrel tumblers run best 50% full. Screened barrels are available for use as a plastic or die-casting deflashing machine. By adding screen doors, parts can be easily separated. What is the Difference Between Wet and Dry Barrel Finishing? Wet barrel finishing is a batch system for removing excess material or polishing parts, employing water and other agents to form radii, remove burrs, improve surface appearance, polish and clean. Wet barrel finishing works well for processing metal. Wet barrel finishing equipment may sometimes be used in dry tumbling operations. Dry barrel finishing is a batch system for mass polishing or removing excess material from plastic or metal parts without liquids by tumbling them in a media and compound mixture. This process is valuable for finishing very delicate parts that would be damaged in a wet barrel. A dry system produces a smoother and higher finish. The finished parts have more of a hand-buffed appearance with greater uniformity. The result is something very difficult to do with hand finishing methods. Although most methods for barrel finishing employ a wet process, dry tumbling has some definite advantages in particular cases. Some factories are not set up to handle large quantities of water, making wet tumbling impossible. Dry tumbling may be used under such circumstances to eliminate hand finishing. ISO Finishing is setup to handle any type of process your job requires. What types of materials can I process in these machines? Any type of material can be deburred, polished, or refined in a CBF including: Titanium, Gold, Silver, Zinc, Aluminum, Brass, Steel, Stainless, Pewter, Beryllium, Barium, Cadmium, Vanadium, Copper, Nickel, Zirconium, Tungsten, Iron, Tin, Vasco x-2m,9310, M50, Vim-var, Bismuth, Palladium, Yttrium, Niobium, Magnesium, Manganese, Scandium, Osmium, Plastics, and Glass. Can I Run Multiple Parts in One Barrel? Yes, in most cases you can put several parts per barrel, depending on size and material. At times when parts are not allowed to come into contact with another; in these situations, depending on type of equipment, parts can be segregated by using divided compartments available with our machines, or a type of fixturing device that will hold the parts in a fixed position. How much does it cost to process my parts? Obviously the cost will differ between projects, but we encourage you to take advantage of our free sample processing services to determine your cost. It is really easy to do, just give us a call or fill out and submit our free sample processing form. We will process a few of your sample parts for you and then return them to you with a fully detailed cost analysis and process report. CBF Machines available from ISO Finishing vary in size from the compact, table-top HZ-12 to the super-sized HZ-330. No matter the size, these machines are built for heavy use with industrial ball bearings and hot poured polyurethane barrel liners that can stand up to wear of running repeated finishing cycles. 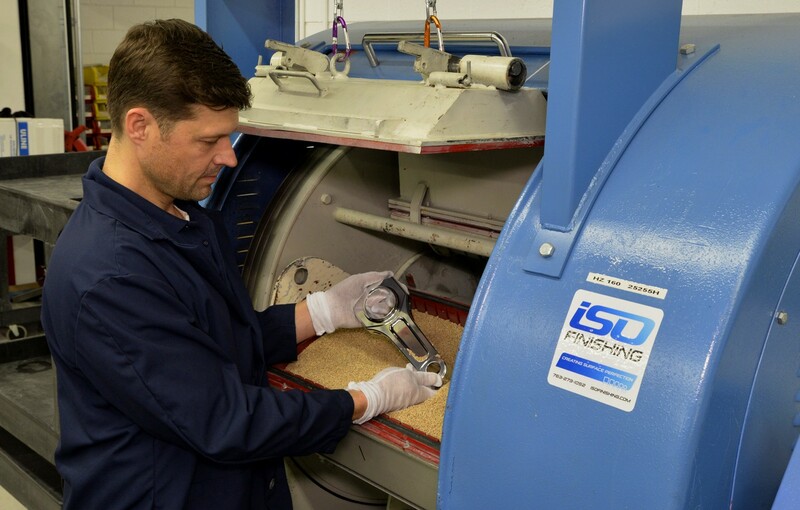 We have worked with manufacturers in industries ranging from medical and aerospace to firearms and OEMs to carry out finishing services and create finished products. These unique industries and their products require attention to the finest of details—and yield virtually no room for error. ISO Finishing works on products made of all types of materials. Contact us today at 1-844-623-7998 for creating surface perfection on your manufactured parts.